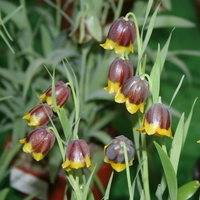 Today it's all about my second favourite genus, the Fritillary. As a child I planted a couple of dozen of the native (or escapee?) Snake's Head Fritillary in our poorly drained orchard in the family garden in Scotland. With its nodding purple tesselated (chequered) or white bells I marvelled as 24 became several hundred in just a few years. I've been hooked ever since. 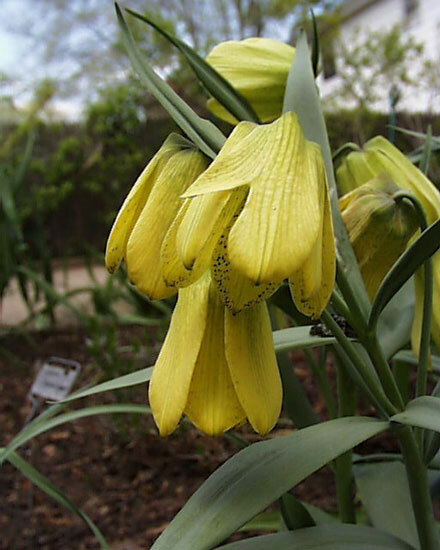 Crown Imperial (F. imperialis), also available in yellow. 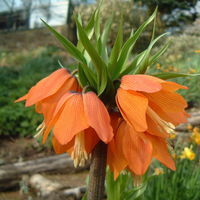 My next foray was to try F. persica in the alpine house (I had a proper one then, self-built in my teens, with louvre windows and everything) and once again fell in love with its chocolate bells held high on a 3ft stem, not unlike (but not that similar either actually) the common or garden Crown Imperial (F. imperialis), probably the most widely grown of the genus in the UK and a low-maintenance cottage garden plant in orange or yellow. 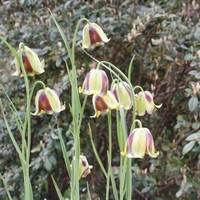 The Snake's Head (F. meleagris) is easy from seed and will naturalise happily in a fairly moist soil, even among grass and can, if you are very lucky, be found in meadows in pockets across Britain. There is some debate over whether it made its way over from Europe in the last ice age or is simply so happy here it escaped from gardens and made itself at home. 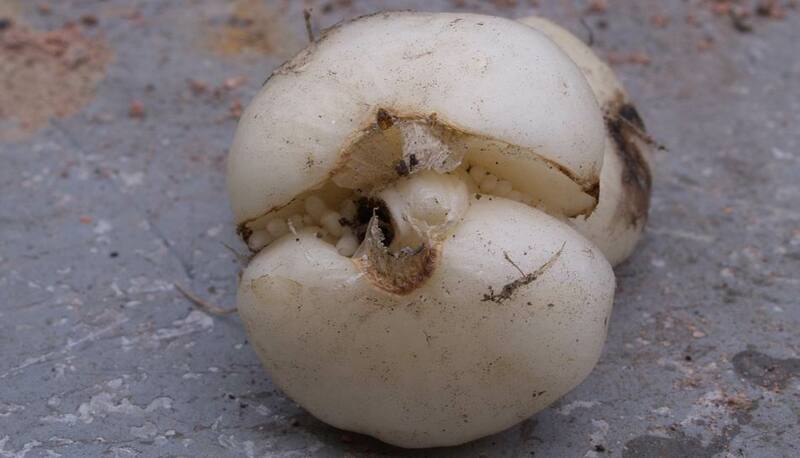 Either way, it's a thing of great beauty, with nodding bells covered in checks just 1-2mm wide of light and dark purple or, in the case of F. meleagris alba, ivory and white. The latter can just pop up anywhere the purple variety grows, the genes seem to be hiding in the purple variety and make an appearance whenever they feel like it. A lot of garden centres offer F. michailovskyi along with their tulips and daffs, suggesting it is easy but I must confess I've never had much luck with it. I'm trying again this year in a pot (I suspect my original efforts were rodent victims). I am also trying my luck with: F. pontica, graeca, raddeana, acmopetala, minuta, pallidiflora, hermonis amana, elwesii and uva-vulpis. "But they all look the same!" I hear you cry. Well, I admit there are similarities but once you've got the bug you'll see the differences! 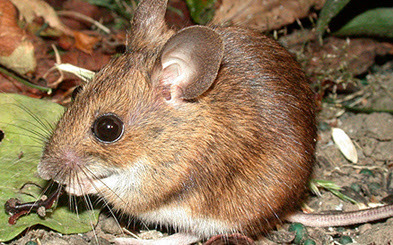 The genus is split in two with one group, mainly purple or brown hailing from north America and the other, including greens and yellows, from Europe and the near east, as a very rough rule. With such a widespread distribution there is no magic formula for success but growing them in pots allows for maintenance of their natural habitat, if you can find out what that is. The internet is invaluable here! Generally I've gone for clay pots because they look nicer and dry out quicker if you have over-watered. 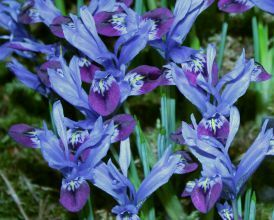 Some of the larger bulbs need deep planting (up to a foot) to prevent them breaking up into smaller rice-like bulbils after flowering. These will of course eventually flower themselves but not for a few years and will probably need splitting to prevent congestion. 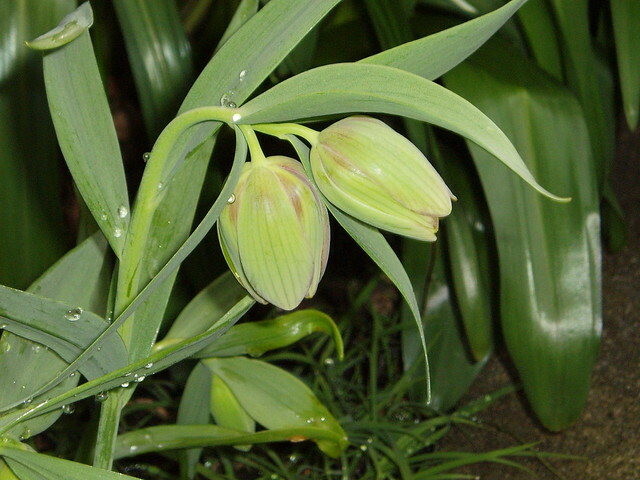 The bulbs are extraordinary looking things (it's quite hard to tell the top from the bottom, one good reason for planting them on their sides, the other being that it prevents water gathering in the hollow top). 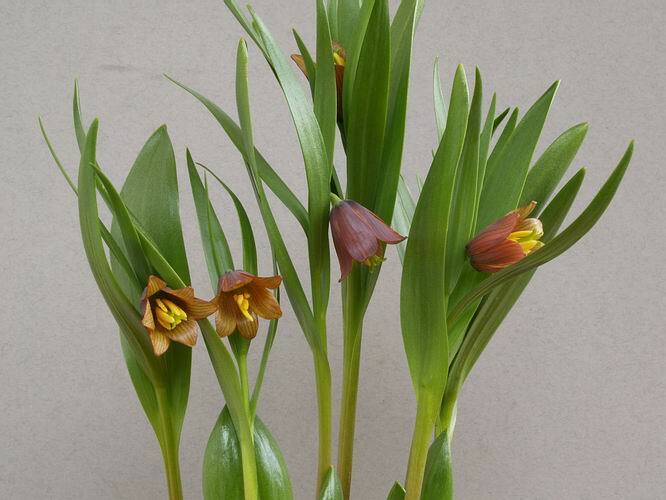 F. raddeana bulbs actually look quite sensible compared to some Frits! I use a mix of an open potting compost with plenty of vermiculite for drainage and slow-release fertiliser granules, grit is helpful for the Caucasian species but generally if you can control the watering you can expect a measure of success. This should also avoid the need for a fungicide but if you think it will help I doubt it will do any harm (to the bulbs, anyway). Wet, not cold, is your enemy! Make sure your pots are squirrel and mouse proofed (I put a garden sieve over mine and keep them raised off the ground to let air in and mice out). 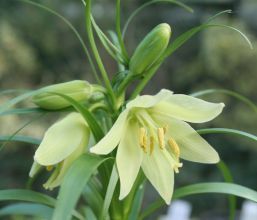 With the exception of the mighty species such as pontica and imperialis follow the usual rule of planting three-and-a-half times the depth if the bulb and plant the bulb on its side, taking account of which side the shoot will come from (you don't want them all facing in or out, mix it up a bit) and the roots and shoots will quickly work out which way they're meant to be going! Once they start to poke through, it's time to start watering and feeding, the more growth, the more water. A food high in potash will help bulk up the bulbs. Keep an eye out for aphids, mould and botrytis in cold, wet spells and spray with a multi-purpose fungicide/mould/bug buster. If you want to collect seed then leave the pods to ripen and sow as soon as you're sure they're ready. If you'd rather bulk up the bulbs, cut off the dead flowers to send the energy back down the plant. Start watering in October and keep the compost just damp, especially if it is cold, and once growth is apparent feed and water as normal. Allow the plant to do its thing and once the foliage has died back remove to avoid encouraging rot and then allow the plant to enter a period of dormancy, essential for success, watering very lightly about once a month until it's time to start all over again in October. 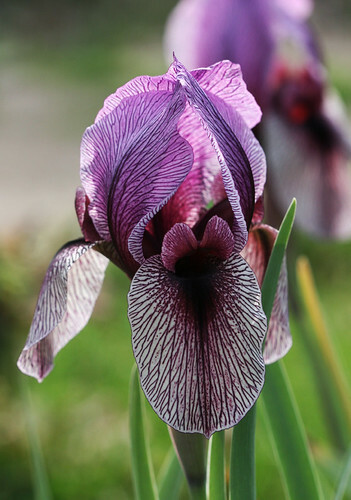 I also planted the oncocyclus Iris "Dardanus" by laying the rhizomes on a gritty compost mix, dosing with sulphur and covering with a centimetre or so of vermiculite. Not sure when to start exposing to water, I certainly don't want it sitting in cold, damp compost over the winter, a recipe for disaster. Also into a pot went the much more straightforward Iris reticulata "Halkis"